The Balkan region is defined as that part of South East Europe bounded by the Sea of Marmara and the Black, Aegean, Mediterranean, Ionian, and Adriatic Seas. The line of the Kupa, Sava and Danube rivers is commonly considered the region's northern limit, but historically and politically the region extends north of this line. It is a little over 766,000 sq. km. 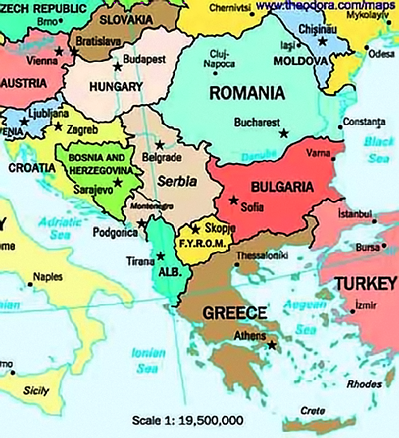 in area and includes the countries generally considered to make up the Balkan Peninsula - Croatia, Serbia, Montenegro, Bosnia and Herzegovina, Albania, Macedonia, Greece, Bulgaria and European Turkey - as well as Slovenia and Romania. In comparison, New Zealand's area is a little over 268,500 sq. km. and France a little under 674,000 sq. km. The population count depends on exactly which countries one includes. Those listed above have a total population of about 70 million people.